WORK IN COMMUNICATION? DISCOVER HOW TO BRING YOUR MESSAGE TO LIFE WITH ANIMATION! Do you work in corporate communication? Are you responsible for the internal communications within your organisation? If so, then you need to understand the massive impact animation can have on the success of your message. 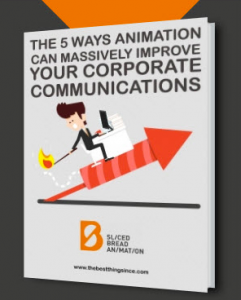 “The 5 ways animation can massively improve your corporate communications” and see for yourself what it can do for you. In your guide you will see the 5 areas that will benefit by having a state of the art animation in place of text, or live action video. At Sliced Bread we are passionate about animation and truly believe that it is the best way for businesses to communicate. The most important thing when marketing or advertising is that you get attention. And if our animation can work for Coca Cola, Sony, and Unilever, imagine what it could do for your business! Used in the right way, and made by the right people, an animation really can be a fun, informative and effective way of speaking to your audience. If you need more convincing on the benefits of animation download your free guide by simply entering your details on the right hand side and start reading now.